This article may contain outdated information that is inaccurate for the current version of the game. It was last updated for 1.4. 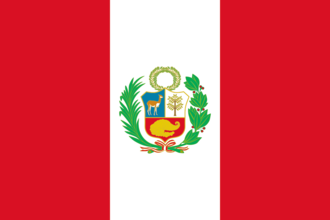 Peru is a country in western South America. It starts with a fairly decent army and navy, and few resources. Peru started to gain political stability in the early 1900's. The great depression hurt the country economically and renewed political instability. Between 1932 and 1933, Peru entered a year war with Colombia over a territory dispute on their borders. The war came to a stalemate, a peace was brokered by the League of Nations, and borders remained unchanged. Peru uses the Generic National Focus Tree. This section may contain outdated information that is inaccurate for the current version of the game. The last version it was verified as up to date for was 1.4. Like all the other states in South America the independence of Peru is guaranteed by the United States. Can force government of another country to adopt the same ideology. The following table may contain outdated information that is inaccurate for the current version of the game. The last version it was verified as up to date for was 1.5. These are choices of ministers and design companies for Peru. Gets event 'Communism on the Rise'. Gets event 'Move towards Democracy'. Gets event 'Fascism on the Rise'. By selecting this Design Company they will permanently affect capabilities on all equipment researched while they are hired. Have a good strategy for Peru? This page was last edited on 16 February 2019, at 14:19.